GRAB A FEED: Drivers Tom Buckler (left) and Michael Hogg (right) with Joan and Dave Redfern. 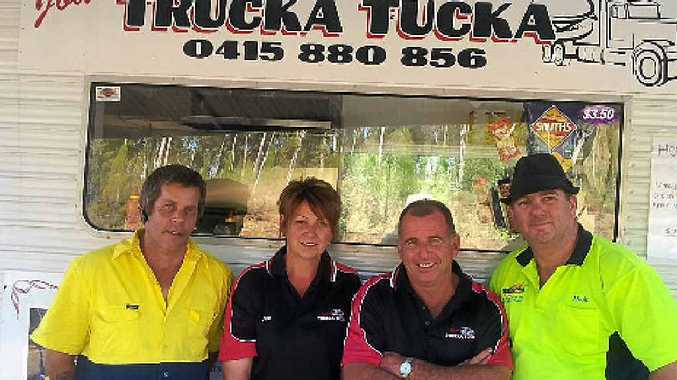 POPULAR food van Joan's Trucka Tucka continues to operate on shaky ground at the Gowan rest area. Since opening the business four months ago, its namesake Joan Redfern said she had been doing her bit to stop fatigue-related crashes in the heavy vehicle industry. But a complaint to the RTA that the van was a traffic hazard means that Joan's Trucka Tucka may have to shut up shop for good. The food van has been serving hungry truckies at the rest area on the Newell Hwy, 10km north of Coonabarabran, in New South Wales. After it's closure a month ago, negotiations with the RTA and help from Kevin Humphries and Duncan Gay, have allowed Trucka Tucka to run on a trial basis until January. "The RTA closed us down and threatened to fine us," Joan said. She said RTA officials tried to tell her truckies did not need food at a rest area as it stopped them resting and they should be using road houses for food. But she said trucks often got booked if they pulled up at the roadhouse in Coonabarabran and they were not allowed to stop in town. While at the rest area there was plenty of parking bays, but no facilities. Joan knows what she is talking about. Her husband Dave is an interstate truck driver and she drives herself. "There's a need for it," she said. That need was apparent as many truckies (including herself) were turned away at driver revivers, Joan said, although no one was supposed to be excluded. And all the truckies that have stopped for a cuppa and a sandwich to help break up their journey agree that Trucka Tucka is needed. "We're on a stretch of road where there's 200km of nothing," she said. The first 100km of road from Gilgandra to Coonabarabran and the second from Coonabarabran to Narrabri was "quite notorious" for crashes and her food van helped with fatigue management. Now Joan's biggest hurdle is proving Trucka Tucka is not a traffic hazard and is wanted by the transport industry. But she has not been able to put signs along the roadside to advertise they are still open, as they were deemed a traffic hazard. "I hope we can stay to meet the needs of drivers. And in the future have some thing a little more permanent." Jumping on the healthy eating bandwagon, which Joan said the drivers wanted, she sells all home made food. "Everything is home cooked," she said. If you get the chance to check out Trucka Tucka fill in Joan's survey and help her tell the RTA how valuable her service is. And if you are on the road and don't have much time to stop, place an order for some tucker by calling 0415 880 856. Joan's Trucka Tucka is open from 8am-7pm Tuesday - Friday and Sundays. Tip: If you are planning on stopping make sure you leave room for others to access the rest area and the Trucka Tucka van.